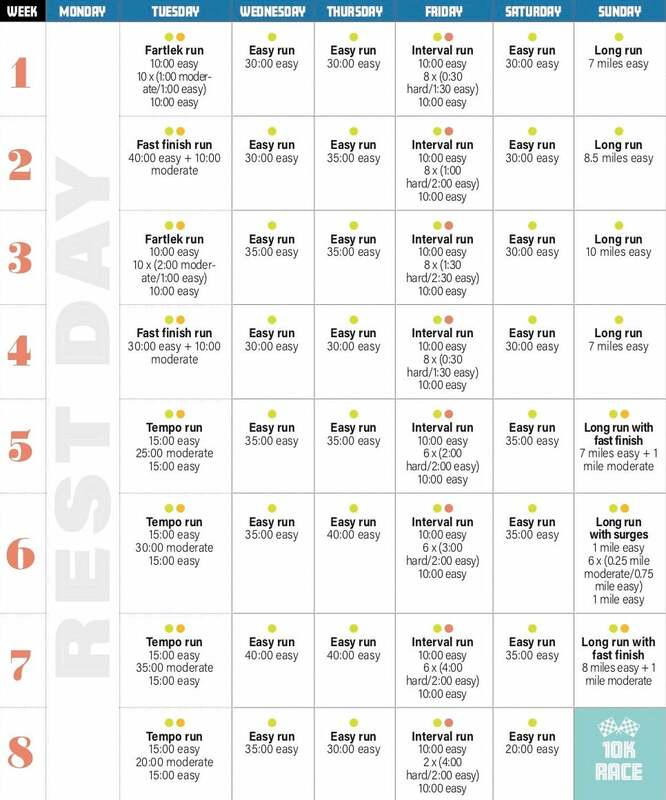 Run your best 10K ever with this 8-week plan. If, as a coach, I could have only one piece of information to use in assessing a runner’s fitness or ability, it would be a recent 10K race time. More than any other competitive distance, the 10K balances the qualities of speed and endurance that every runner needs to succeed at any distance. For the same reason, the 10K is a great starting point for a quest to become a more balanced runner. If you can improve your 10K, you’re in a better position to improve as a miler or a marathoner—or anything in between. So, why not start the 2019 race season with a 10K? If you’re experienced and hungry to improve, our PR Plan will build on your existing fitness base with a challenging program that will leave you feeling strong and confident on race day. Within this plan, intensity is prescribed with a three-level descriptive system. “Easy” runs and run segments should be done at a pace at which you can carry on a conversation fairly comfortably. This is a little slower than most runners naturally choose to do their easier runs, so you may need to actively hold yourself back. “Moderate” run segments should be done at a pace that rides the line between comfortable and hard. You’re pushing but not straining. Aim for a subjective effort level of 6 on a 1 to 10 scale. Finally, “hard” intervals should be done at a 90 percent effort for the interval set taken as a whole. 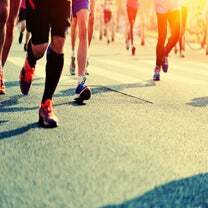 For example, if the workout calls for you to run 8 x 1 minute hard with 2 minutes of easy jogging between intervals, run the hard efforts at a pace that leaves you feeling as if you could have done the whole thing about 10 percent faster if you had to (or have done about 10 percent more work at the same pace). This means that the longer the hard intervals are and the more total intervals you’re asked to do, the more you’ll need to control your pace. No matter what your current 10K PR is, be sure to listen to your body throughout the training process and either scale back a workout or take a day off whenever you feel extra tired or sore. Click here to download the Best 10K Training Plan PDF.